Jade is a new class of product unlike anything seen before. It is a durable, repairable, sustainable electronic device for learning STEM topics. It is humane technology that produces non-addictive fun, much like your favorite hobby. Build. Code. Test. Measure. in real-time. 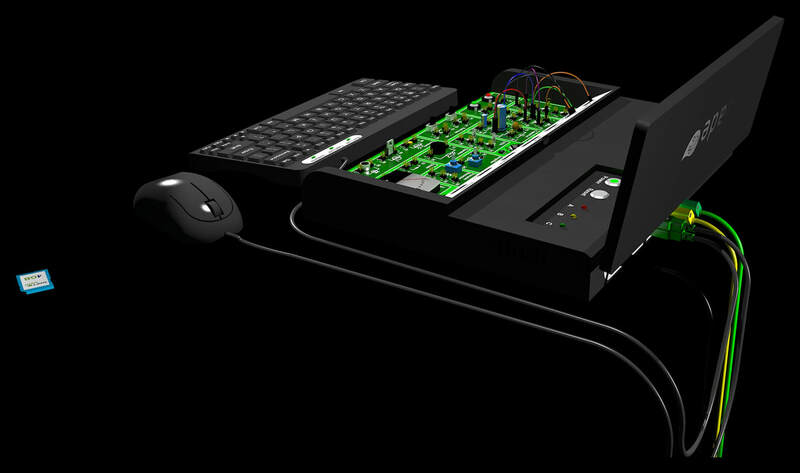 Jade combines programming and electronics in a real-time context. It is uniquely fun. Type code and instantly have a result. Connect a wire and instantly see on-screen measurements. Type a command and instantly create an electrical signal. Draw an electronic schematic and simulate it. It will interact with code you have written while generating real electrical signals. Due to real-time feedback, Jade puts you into a "flow state" while allowing you to learn practical skills about sustainability. No other product comes close. Jade's unique technologies match skills and challenges, allowing it to grow with you regardless of age or skill level. Science, engineering, and programming have never been taught this way. Jade makes no attempt to hide electronic parts in cute boxes. Every part of the design has received careful consideration of how it will affect its learner. Humans are extremely neuroplastic, and our thoughts for the day can change trajectory from something as simple as a particular sight or sound. Jade provides an optimal experience for learning. Children will learn in a manner that is optimal to them. Adults will have a unique experience. Our perception of electronics has been tainted by a disposable mentality, forced on us by an industry. On the surface, Jade looks like a consumer electronic product. However, due to its real-time, patent-pending technologies, Jade provides an experience unlike any other. Built for Humanity. Made Locally. Durable. Repairable. Humane. Sustainable. These words are missing from practically every consumer electronics company today; Jade embodies all of them. Disposable electronics threaten our planet. 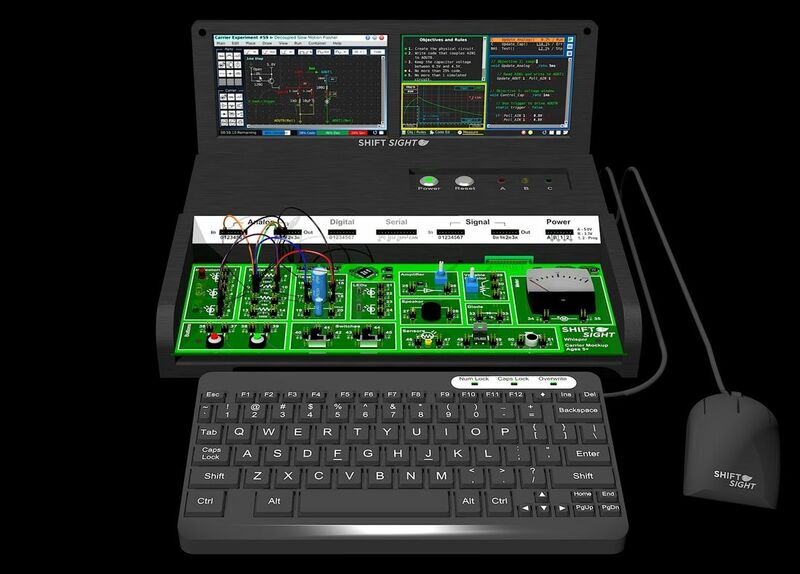 Jade is being designed with ruggedized components that last for at least 20 years. Exposed connectors have active and passive protection. Jade will survive shocks, drops, spills, and static electricity (ESD). Internally, Jade is designed for repair and troubleshooting. (Even durable products eventually break.) A mockup circuit board shows some of these elements, missing from virtually every consumer electronic gadget. Current products emphasize component packages that are hard to remove or replace; connectors that break; or custom parts that cannot be sourced from anywhere but an obscure manufacturer. Jade's use of AEC-Q100 components ensures a long lifetime and a long availability. Jade will be designed, manufactured, and assembled locally in the United States. Tablets are for girls and laptops are for boys, right? This made-up comment is clearly untrue. But, in the edtech industry, the current products are being aligned to genders. A robot for a boy and a fashionable, wearable "maker" kit for a girl. These stereotypes do not help anything or anyone. 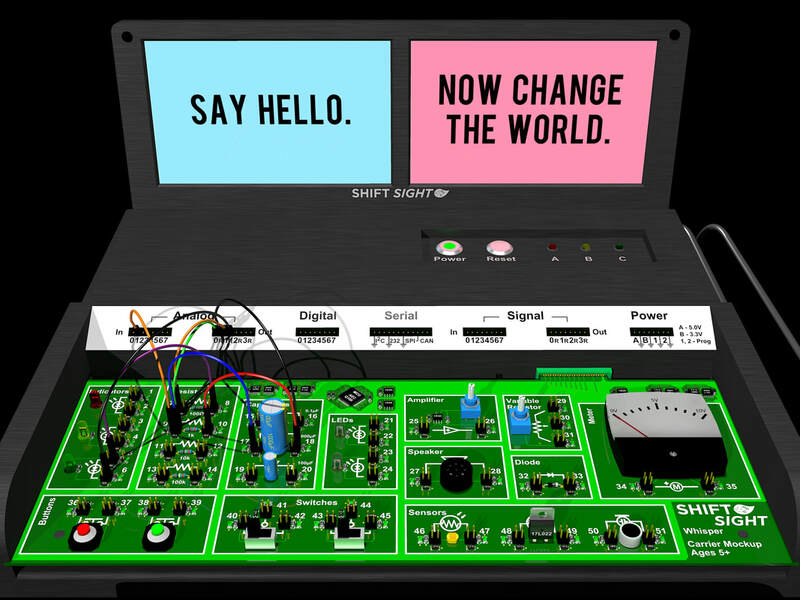 Shift Sight understands the neuroscience behind gender-neutral design. Jade is a product that can be enjoyed equally by boys, girls, men, and women. It is the electronic equivalent of a piano or a paintbrush: a gender-free, real-time tool for creative expression and development of problem-solving skills. Jade aspires to change an industry and guide a generation. It is a tool that develops creative thinking while teaching sustainable design practices. Its core programming languages have been entrenched in industry for more than 40 years. Jade is approximately the size of a laptop that has been made taller to accommodate the curriculum expansion boards. Out of the box, it allows a student to learn programming in BASIC or C in a self-directed manner. An onboard, interactive curriculum that matches skills to challenges ensures friction-free fun. BASIC has a proven track-record for ease-of-use and fun. It was the language of choice when personal computers were for learning. C, on the other hand, is versatile and entrenched in industry. Jade's support of it allows your existing code to interact with the real world with minor changes. In real-time, a learner can type commands that generate electrical signals or take electrical measurements, similar to laboratory equipment. 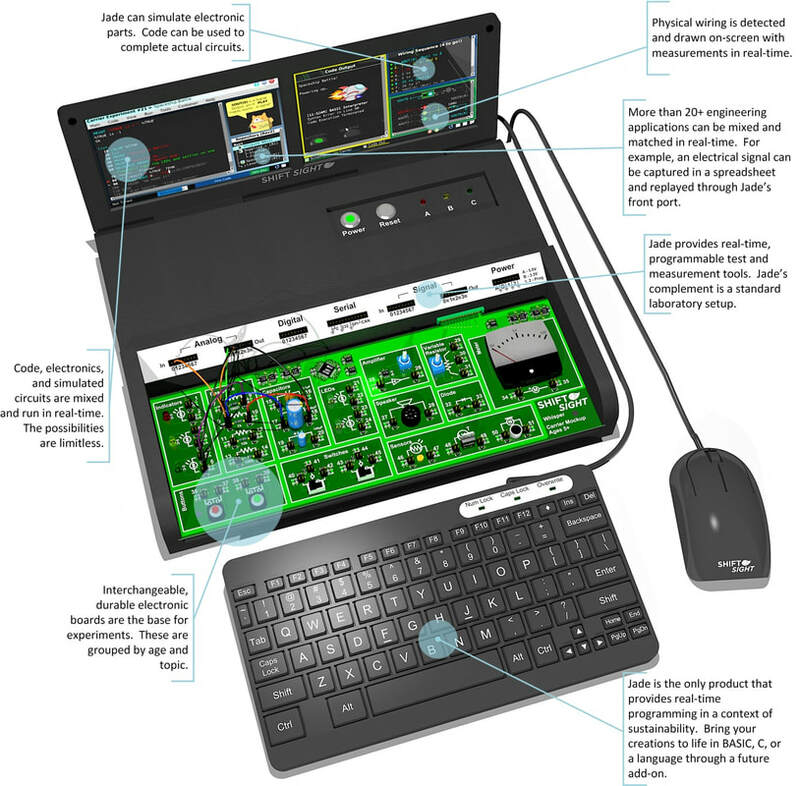 Jade is a programmable, real-time lab at your fingertips. Shown above is a Carrier Board, the expansion component for Jade. 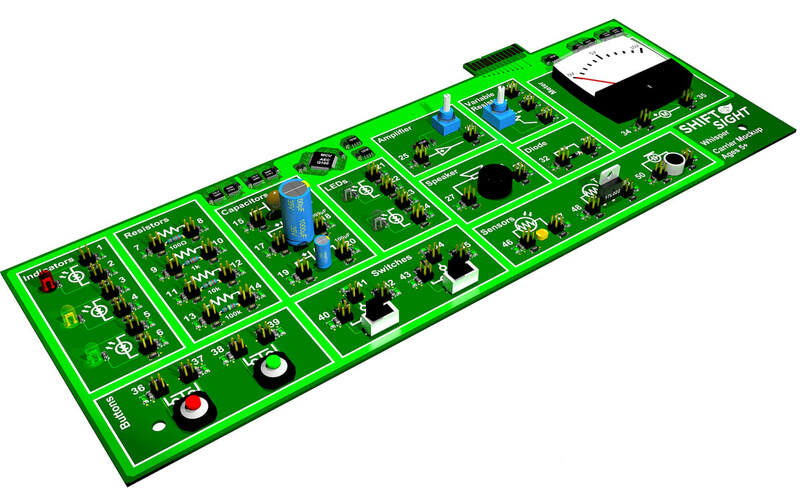 Each board consists of components that may be used in experiments (provided electronically on the board itself and via a textbook). These components are protected actively and passively from damage. The boards are grouped according to age or subject material. The boards are built with the same durability as Jade and should also last 20 years. Adding a Carrier to Jade provides a unique synergy. The board's topics literally come to life through Jade's real-time programming and interfaces. The whole becomes much greater than the sum of the parts. The Carrier sends information to Jade in real-time regarding wiring and electrical measurements. This reveal is the first look at Jade. We at Shift Sight hope that you are amazed by what you have seen. The website, including this Jade page, will be properly revised in the future. The reveal will be made permanent with more renderings, diagrams, walkthroughs, and photographs. All material on this page is patent pending and is protected under United States and international laws.